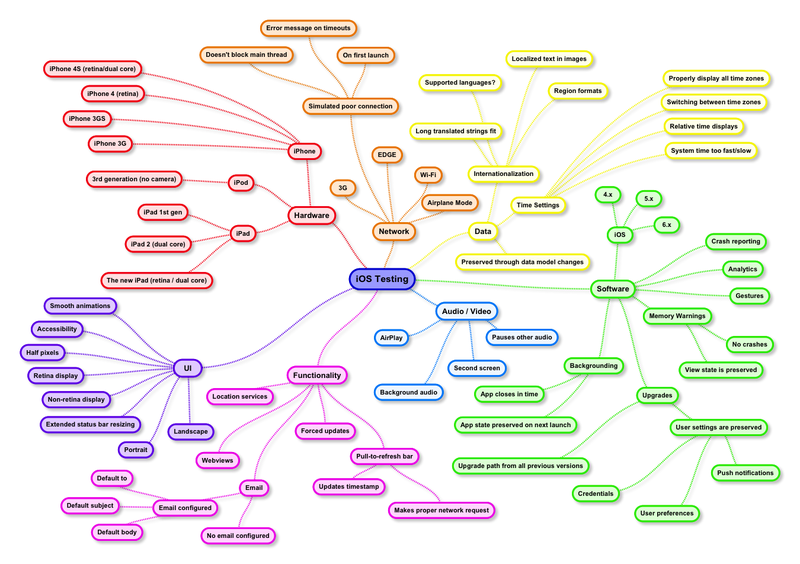 A few months ago I had come across this great Getting Started with Mobile Testing Mind Map by Ministry of Testing. This mind map simply blew me away and I’ve decided to comment lengthly and share my insights, based on my vast expertise in the Mobile Testing domain. Then after reviewing Rosie‘s (the author) response, asking for my collaboration with future mind mas, it was only a matter of time until I raised the glove and started brainstorming. I’ve been introduced with Nick who has a vast experience in mobile testing in general and iOS testing in specific, which wished to have a platform specific mind map. Nick & I started the collaboration process and the iOS testing mind map started to grow bigger and bigger to the point that we had to break it down. We managed to drill-down to so many specific test cases and we believed that these should be referenced in a dedicated mind map or maybe a series of mind maps as Rosie suggested. At the end we narrowed this mind map to a digestible and practical one which will be easy to follow and will cover the fundamentals of iOS testing as we see it. Should you feel that there are missing test cases or ones which are irrelevant to you – you’re more than invited to grab the project file and adjust it to your needs. The application we used was SimpleMind Desktop, though you’ll need to get the pro version to import an existing mind map. The full version costs money, however could be used free for a period of 30-days and I highly recommend it! Make sure to also visit the iOS Testing MindMap / Checklist post which was published on the Ministry of Testing website. As I’m a big fan of cloud storage/sync services I’ve been using them all – first for testing purposes. From DropBox, through Google Drive, MS SkyDrive, Sugar Sync, CX.com, Cubby and the list is growing! I’ve recently came across a new cloud service which is called simply COPY. These guys give you a head-start of FREE 20GB + additional 5GB storage per each successful referral – which seems to be unlimited, at list for this service launch/introduction period. So, here I was registering for yet another cloud service with great storage basis, and do not know what to except from it. Well, I’ve installed their iOS versions – iPhone & iPad, and I must say that the app looks & feels pretty good. However, it does seem to miss many basic features such as Auto-sync of folders or even select-all feature when trying to upload multiple-files. Yet I’ll stick around and see how it evolved and update you, my lovely readers & supporters. In the meanwhile, you’re all invited to give it a shot and share your thoughts about it.